In the sequence of this series, let us analyze today the figure of St. John the Apostle in the scene at Knock. The figure of St. John is perhaps the most interesting aspect of the Knock apparition. Indeed, it was the presence, pose and symbolism of St. John that first drew me to further study the message of Knock. Before entering the subject of St. John’s presence at Knock, allow me to present a few details concerning this special Apostle. St. John was the youngest of the 12 Apostles. He was a virgin and because of his virtue and purity, he was often referred to in the Bible as “the disciple whom Jesus loved.” He was the one to whom Our Lady was entrusted by Our Lord himself from the height of the Cross. He was the only Apostle who did not flee, but was present at the foot of the Cross. Along with St. Peter and St. James, St. John was present at the Transfiguration on Mt. Tabor, the Garden of Gethsemane and most of the other significant events of Our Lord’s life. At the Knock apparition, the figure of Our Lady was immediately recognized by the witnesses and required no verbal or written proof. She appeared in the front and center, a little taller than the other two figures and was clearly the focal point of the apparition. However, the identity of the third figure, St. John, was not so easily recognized and he was, at first sight, referred to simply as “a Bishop” because of the miter on his head. The simple peasants of Knock came to realize that the “Bishop” was St. John the Apostle through conversations during the apparition. One of the witnesses had recently been to the city of Lecanvey where she had seen a statue of St. John very similar to the third figure in the apparition. St. John, indeed, is the only one in Sacred Scripture to use the expression, “Lamb of God,” which was first used in the first chapter of St. John’s Gospel. St. John reports that this expression was used by St. John the Baptist when he saw Our Lord approaching: “The next day, John [the Baptist] saw Jesus coming to him, and he saith: Behold the Lamb of God, behold him who taketh away the sin of the world” (John 1:29). And, also, “And beholding Jesus walking, he saith: Behold the Lamb of God.” (John 1:36). It is also interesting to note that the apparition of Knock took place outside St. John the Baptist Church. The use of the word “Lamb” with a capital L, which refers to Our Lord, appears many times in St. John’s Apocalypse. But, let us discuss this in another article. Why did he appear in 1879? What was happening or about to happen in the spiritual sphere, the Church, and the temporal sphere, the State? Why was St. John dressed as a Bishop and preaching from an open book (probably his own), appearing after the forced temporary suspension of the First Vatican Council (1871) and before the final threatening apparition at Fatima (1917)? It is not the custom to depict Apostles wearing a Bishop’s miter. Usually they are represented with the tongue of fire from the Pentecost, a halo, or nothing on their head but holding an identifying symbol such as keys, a sword, etc. 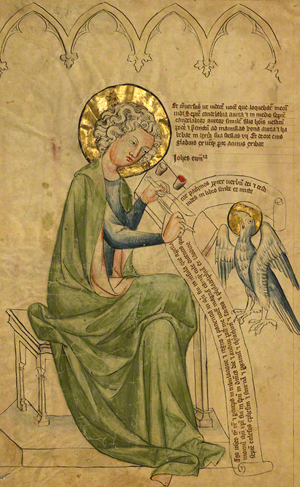 Why this unusual depiction of St. John as Bishop of Ephesus? I believe that St. John’s presence at Knock, with the special emphasis placed on his bishopric is something too unique and too unusual to not have something to do with Our Lady’s message at Knock. If we consider the en masse apostasy, betrayal and silence of the present-day Bishops, including the Bishop of Rome, the appearance of the Bishop St. John becomes even more significant… even critical. Is the presence of Bishop St. John in a “living tableau” in Knock in 1879 an indication of the future presence of Bishop St. John living in our own time? In my next article I shall discuss this possibility. 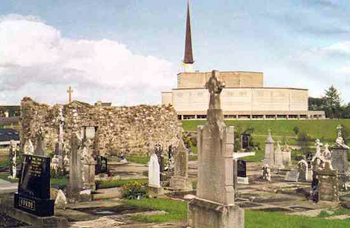 “I live in Knock, I remember the night of the 21st of August, my cousin Dominick Byrne, came to see us at about 8 o’clock p.m. and called me to see the vision of the Blessed Virgin Mary and other saints at the south gable of the chapel. I went with him. When I reached the south side of the chapel, we saw the image of the Blessed Virgin Mary, having her hands uplifted and her eyes turned up towards heaven, as if in prayer and she was dressed in a white cloak. To her right I saw St. Joseph, and on her left St. John, just as the other persons had told me before I came. I saw an altar there and figures representing saints and angels traced or carved on the lower part of it. The night was dark and raining, and yet these images in the dark night appeared with bright lights as plain as under the noonday sun. At the time it was pitch dark and raining heavily, and yet there was not one drop of rain near the images. There was a miter on St. John’s head, nearly like that which a bishop wears. I was there for only one quarter of an hour. At the time I was there, five other persons were in it with me, looking at it with me, looking on at the Apparition. All the figures appeared clothed in white. The whiskers on St. Joseph were an iron grey. 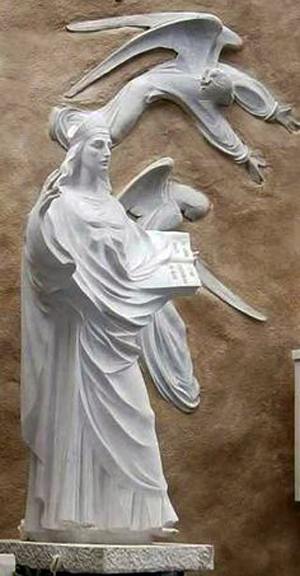 The Blessed Virgin had on a white cloak. The reason I had for calling the third figure St. John is because some saw his statue or his likeness at Lecanvey parish chapel.